DealDash Reviews - Is it a Scam or Legit? Established in 2009 and based out of New York City, DealDash is an online social marketplace that claims to provide a 100% risk-free alternative to penny auctions with the ability to purchase items at up to 60-99% off retail price. According to the company’s website, DealDash maintains high moral standards, and operates with integrity and honest business practices. 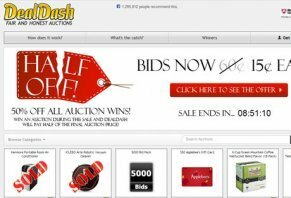 DealDash auctions are available for a wide variety of products, including tablets, headphones, gift cards, TVs, toys, tools, kitchenware, bid packs, and much more, and the company claims that the majority of winners obtain products at 60-99% off retail pricing. This, in combination with the claim that most bidders win their auctions, and that the average top bidder wins more than six auctions, has propelled DealDash to acquire more than 1.5 million users since its founding. In fact, the site is one of the largest and longest-running companies of its kind within the United States. From a customer satisfaction standpoint, DealDash has a Better Business Bureau rating of A-, and nearly 1.2 million Facebook likes. In an effort to further expand its reach, the company has also been recently running a number of television advertisements. Although DealDash classifies itself as a “fun social marketplace” and claims to be an alternative to conventional penny auction sites, their business model closely resembles standard sites such as ZBiddy and Quibids. However, there are some minor differences that you may find beneficial. With DealDash, there are no upfront membership fees—simply purchase bids in packs of 60, which are priced at $36 each ($.60 per bid). Once purchased, you’re ready to start bidding on items of your choice. Each bid will cost you one “bid” (e.g. your total number of available bids will decrease by one). For every bid placed on an item, its price will increase by one cent. While this may initially appear too good to be true, one important factor to keep in mind is that higher demand items such as TVs, tablets, high quality headphones, etc., will almost always result in more competition and higher prices. Once an auction’s time has expired, and if you’re the winner, DealDash claims you’ll receive the item at 60-99% off of the retail pricing, including free shipping. To put this in perspective, this means a $599 iPad could be purchased for less than $30. As a result, DealDash limits you to six items valued less than $200, and three items more than $200 per week. In order to ensure that everyone has a chance to win, DealDash also limits users to one account per person, and no more than two accounts per household. The company also restricts employees, as well as their friends, family, and relatives, from bidding. Allowing users to recoup their “wasted” bids by purchasing the item at full retail price. However, let’s put this in perspective. If you were trying to score a great deal on an iPad but lost the auction, wouldn’t it be more convenient—and less expensive—to simply visit an Apple store near you? This would allow you to immediately purchase the iPad, and save $60 in bids. Sure, DealDash claims you would receive all your bids back, but the math simply doesn’t add up. Here’s another interesting observation we made during our research: At the time of this writing, a DealDash user won a 2012 model 32GB Apple iPad with Retina Display, for slightly less than $30. However, keep in mind that the 32GB iPad Air was released on 11/1/13, and retails for $599. This means that, should they have lost the auction, they would have had to pay $599 for last year’s model in order to recoup their bids, and wouldn’t have even received it directly from Apple. So while it may seem compelling that DealDash provides you with an opportunity to regain your lost bids, if you add everything up, it usually doesn’t make good financial sense. From a complaint perspective, many users have expressed that they felt misled by DealDash, and were charged more than they thought. They assumed they were entering their billing info only for security purposes, and were surprised to see a $36 charge appear on their credit card statement. So remember that if you sign up for DealDash, you will be charged $36 for a pack of 60 bids. Other DealDash complaints include the unfair use of bots to artificially increase the price of an item, or to ensure that no one wins the auction, and that some users hold multiple accounts. DealDash claims they use top-notch software and algorithms to help ensure this doesn’t occur, but there are always loopholes where users can manipulate the system. So, what’s the bottom line for DealDash? Based on our research, it appears that the company is one of the more reputable penny auctions sites available. However, despite these intentions, their business model is to make money—not necessarily to help you save it. With this in mind, you should approach DealDash with more of a gambling mindset than a social marketplace one. This way, if you do lose, you’ll minimize your disappointment. Write a Review for DealDash!